Our dogs are part of the family, so when it comes to their birthday (or gotcha day) we want to make it special. 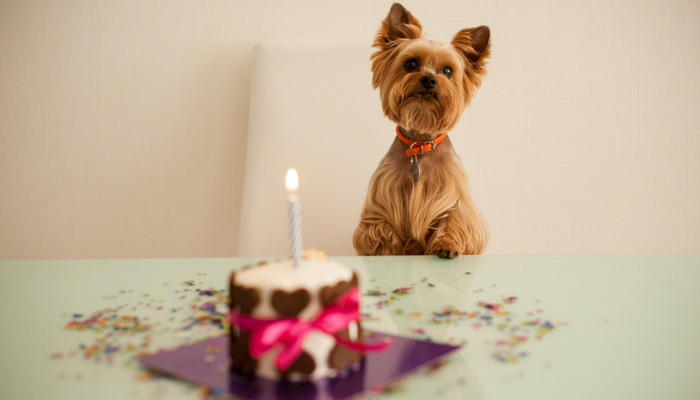 The good news is there’s plenty of fun and easy ways to make your dog’s birthday memorable. So if you’re not sure what to do to celebrate your dog’s birthday don’t worry, I’ve got you covered. From hosting a doggie birthday party to having a doggie movie night, here’s 10 fun ways to celebrate your dog’s birthday. If you’re looking for a way to make your dog’s birthday extra special it’s hard to go wrong by hosting your own doggie birthday party. Invite some of your friends and family over (along with their friendly dogs) to celebrate. If you’ve never had a bunch of doggie guests over to your home before I recommend starting small. 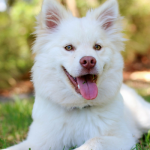 When it comes to doggie birthday parties there’s nothing wrong with keeping it intimate; having a few doggie friends over will be more than enough to make it a memorable day for your dog. You can serve dog friendly cake, give out “doggie bags” filled with treats & goodies, and play some fun doggie games. If you’re going to be holding your dog party outside remember to make sure that all of the dogs have access to fresh water and shade at all times. And remember to keep an eye on things and make sure the dogs are supervised at all times. If you’re looking to get your dog an extra special gift for their birthday try letting them pick it out themselves. Take your dog to your local dog-friendly pet store and have them browse the aisles and pick out their own gift. 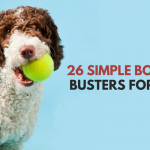 If you prefer treats over cake check out these 25 easy homemade dog treat recipes. 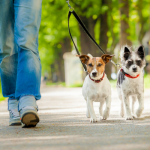 How much does your dog love their daily walk? You can make your walk extra special on their birthday by taking them somewhere brand new. Explore a new hiking trail together or take your dog to a new park. To make it even more fun for them remember to give them some extra time to sniff around and take in all those new and exciting smells. If you want an easy way to make your dog’s birthday extra special try pampering them. Spoil them and give them some extra love and attention on their special day. Give them a nice homemade meal, an extra long walk, a stuffed Kong, a relaxing doggie massage, and some nice cuddle time on the couch. My dog Laika gets a fun new toy on her birthday, and I make the unveiling process a little more exciting for her by letting her unwrap it. If your dog doesn’t have unwrapping experience keep it simple by using a gift bag. Remember to watch them closely — some dogs have a tendency to eat anything in sight, including wrapping paper and shredded bags. Another simple way to make your dog’s birthday extra fun is by setting up a doggie playdate for them. Invite your dog’s best dog friend over for some play time. 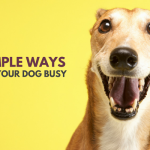 It may seem rather simple, but that one on one play time is really fun (and exhausting) for your dog. Just remember to keep an eye on things, and make sure the dogs have access to fresh water at all times. Most dogs love to swim, so if you want to make their birthday a fun one turn it into a swim day. You can take your dog to the local beach, or search for any dog friendly pools in your area. Just remember to keep an eye on your dog at all times, and follow the basic swimming safety tips for dogs such as bringing along fresh water and cleaning them off afterwards. One of my favorite ways to celebrate my dog’s birthday is by having a movie night. Put on your pajamas, make some popcorn, and cuddle up with your dog on the couch and watch some movies together. Bonus points if you watch dog movies. How do you celebrate your dog’s birthday? Have you ever hosted your own doggie birthday party? Do you wrap your dog’s presents? Does cuddling up on the couch with your dog watching movies sound like a perfect evening, or is it just me? This post contains affiliate links; if you make a purchase I’ll earn a commission. For more information please see our disclosure page. Oooh I like the idea of having friends bring their dogs for a doggie party. Since it might get a little crowded, maybe we could all go to a local dog park instead. That is what we are doing too! Wow! So many fun ideas! My dog’s first birthday will be next month. We are so excited. Thank you for sharing these great ideas! My dog has a tough time playing games lol he doesn’t understand a ball.